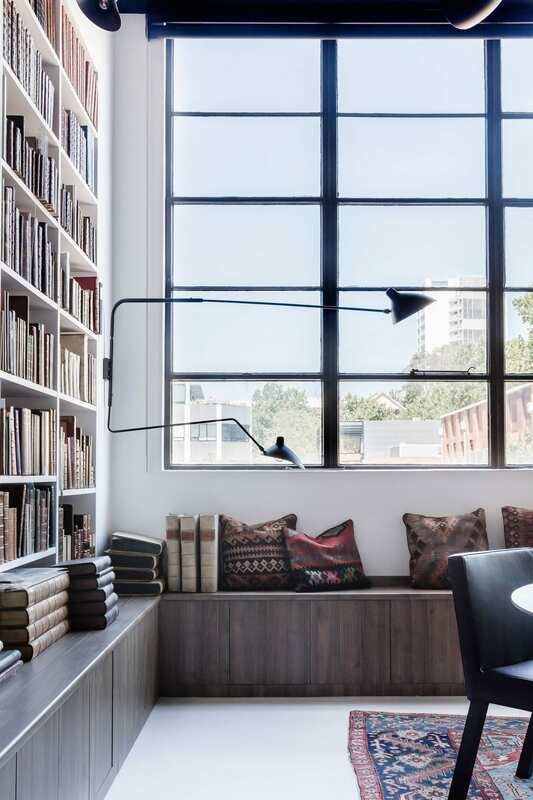 Rare Bookseller’s Office Space in Surry Hills, Sydney by Busatti Studio. 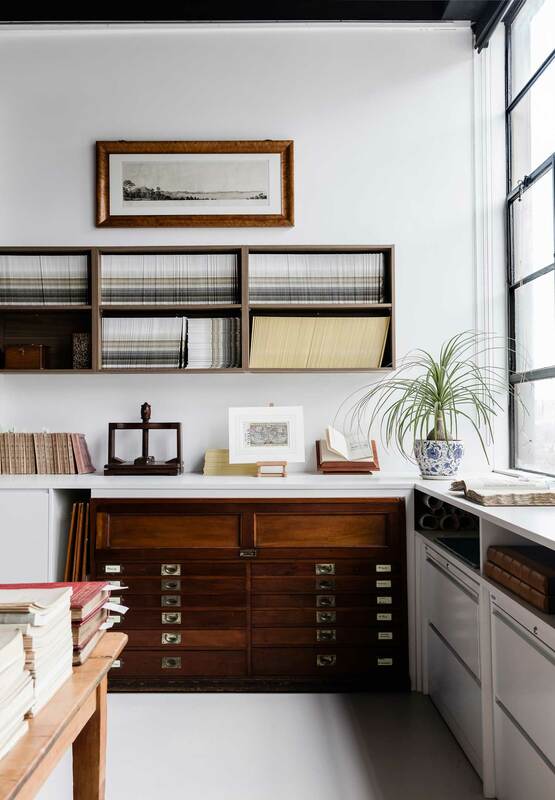 was commissioned to create an inspired new workspace and an important showcase for renowned Sydney bookshop and their vast collection of rare books, manuscripts and paintings. 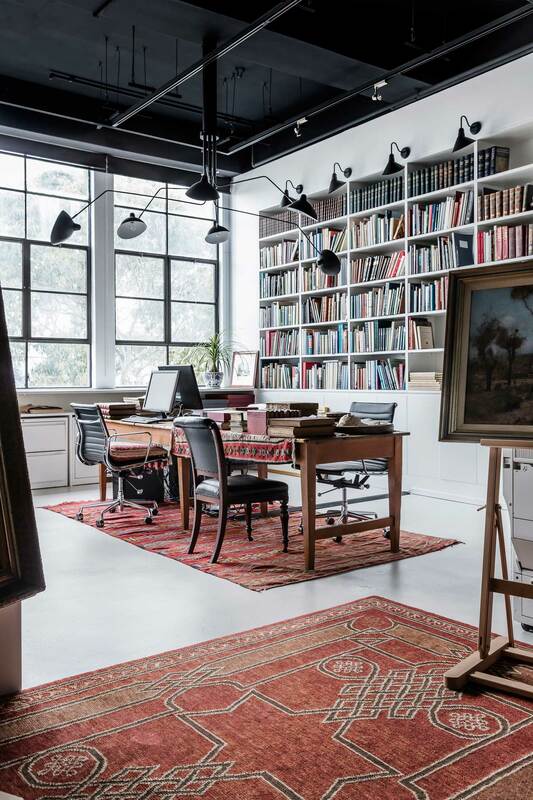 Antique books and rare artworks are beautifully displayed in this industrially inspired workspace, which saw an empty warehouse get transformed into a library nirvana. 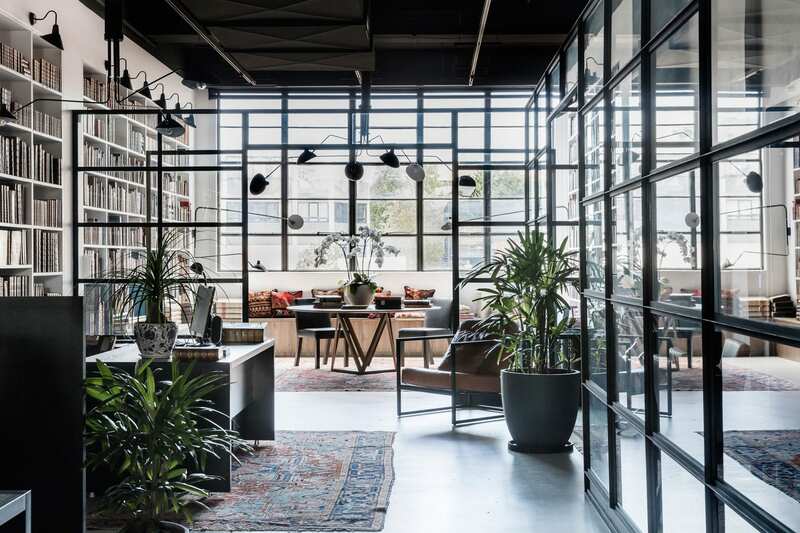 The company’s relocation from their heritage Potts Point offices they had occupied for three decades into a spacious converted warehouse in the heart of Surry Hills was a transformative journey. The old pokey rabbit warren of dark corridors and closed offices is now an open plan layout bathed in natural light, celebrating a modern approach to the antique book market. 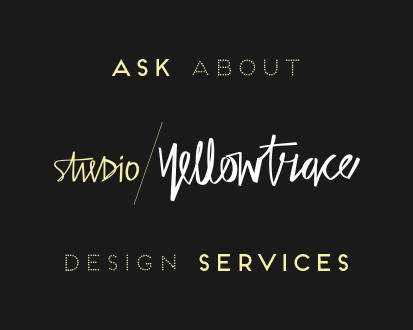 A considered floor plan accommodates all the specific business functions ranging from the private work area and public display, with carefully calculated custom joinery. Cabinetry is designed to stretch over 180,000 linear meters of open shelving, with an additional 91,000 linear meters of closed cupboard storage. The new office consists of an entry reception, Jewel Room designed to play host to private viewings and intimate functions, his and hers bathrooms, storage area, one private financial office and three semi-partitioned management offices, a kitchen with dispatch area and breakfast bar, and a shared hot desk library hub. 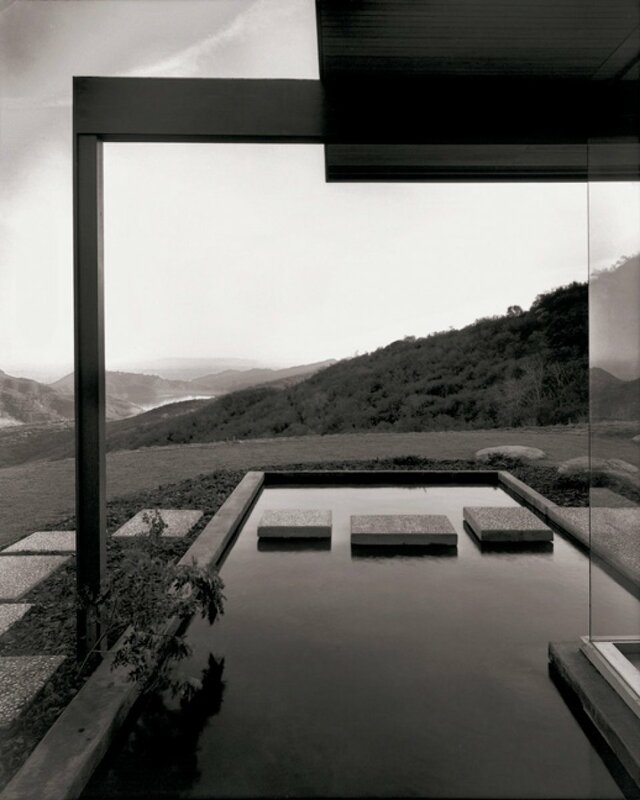 Integral to the design was the ingenious use of aluminium mouldings and timber beading to create a cost-effective and lightweight alternative to steel framed glazing throughout. 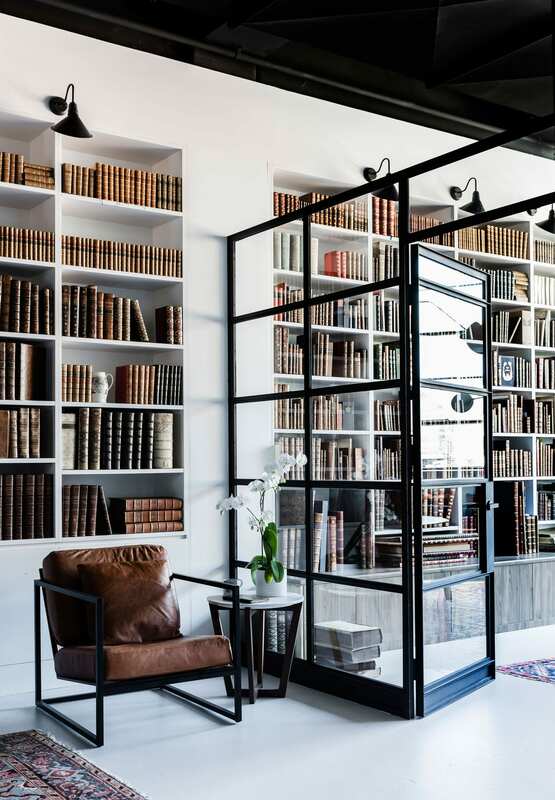 Used as both full and half height partition walls, the framing echoes the original windows and industrial integrity of the space. 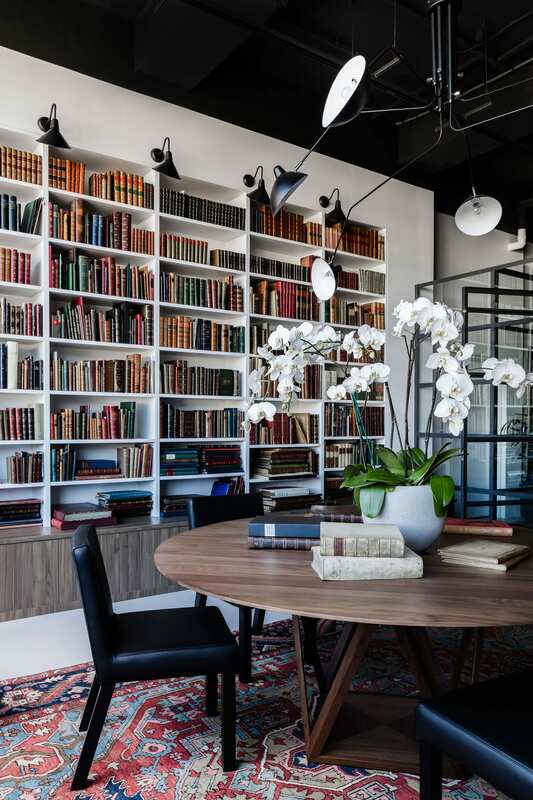 A minimalist palette of white laminate and walnut timber joinery, painted concrete floors and black and tan leather office furniture offsets architecturally inspired lighting and the client’s own collection of vibrant, antique carpets. A statement Tobu table in oiled nutwood finish takes pride of place in the Jewel Room. 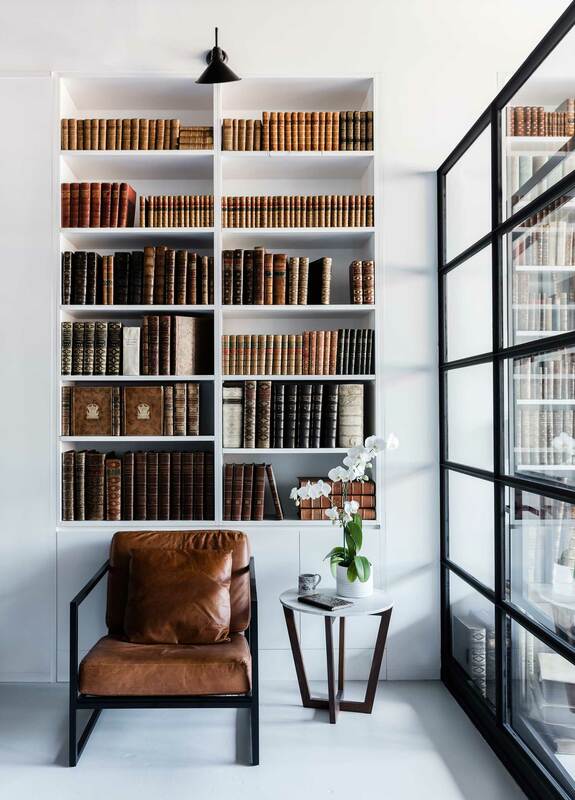 These clever choices by Busatti Studio create a precise and thoroughly modern library space for one of the world’s greatest antique book collections. PET Lamps Ramingining by Alvaro Catalán de Ocón & Indigenous Australian Artist Weavers.